Baobab MX3 is a double-sided mini wireless air mouse multimedia keyboard. 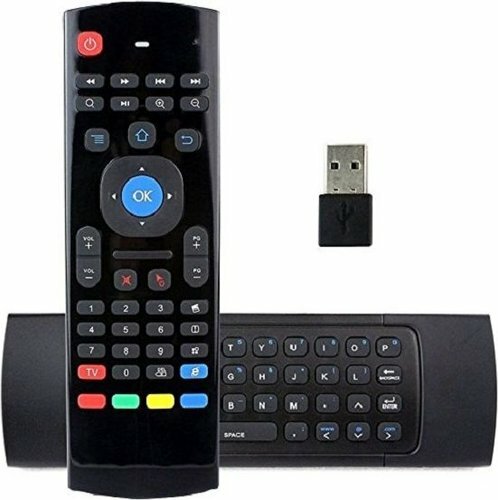 It is compatible with desktops, laptops, Android smart TV & TV box. The back side of the keyboard is an IR programmable remote for most TV sets. Front side is a mini multimedia 2.4G wireless QWERTY keyboard. It comes with Voice search& calls. It’s convenient and easy to use: just plug & play! It has built-in 6-axis inertia sensors for better operation accuracy. Note: Your device needs a free USB port to communicate with the Air mouse via its wireless dongle.